GREAT PRICE! Below Seller's Cost!Paradise...your own chalet in the midst of 8.238 acres of trees, perennials and shrubs overlooking a recreational pond and beautifully handcrafted bridges that cross the winding creek. Magnificent views can be seen from every angle of this 1.5 story with glassed in front porch and deck off the greatroom. Quality is evident throughout from the marble/ ceramic tile baths and hardwood floors to the granite kitchen counters, 2x6 construction, solid wood doors, two high efficiency heat pumps(average bill is $128 per month for all usage, etc. The two car garage is deep and can easily hold 4 cars. Fully paved driveway. 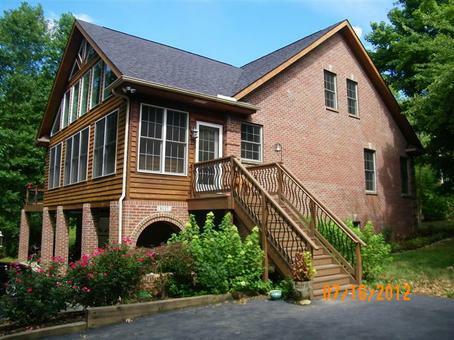 For the buyer who loves nature, this rustic and unique home is just minutes from Lexington, Nicholasville or I-75!